NASHVILLE -- Buyers are not the only people Nissan hopes to attract with its upcoming electric Leaf. It also wants to meet new dealers. 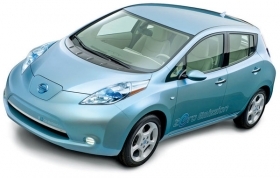 The automaker is using the Leaf as a conversation starter to talk to retailers who might be interested in adding a Nissan franchise, says Brian Carolin, Nissan North America Inc.'s senior vice president for sales and marketing. "It's not just new partners wanting to add the Nissan brand to their portfolio," he says. "It's also existing partners wanting to expand. The shrewd businessman sees the potential. And that will accelerate as we get closer to launch." Carolin believes the allure of a mass-market electric vehicle will help Nissan fill in some holes in its U.S. market coverage. Most notable among them: San Francisco. Few cities in America have a more environmentally conscious reputation than San Francisco. Yet Nissan, which counts heavily on West Coast sales, currently has no dealer in downtown San Francisco. "We will fill that point," Carolin vows. "I can't say it will be next month, but we will definitely have representation in downtown San Francisco. That Bay Area is such an important green market." With the Leaf launch eight months away, Carolin has been talking with dealers who have never considered a Nissan franchise. "I think this car can act as a real halo for the Nissan brand," he says. "It can have a transformative effect on the Nissan brand and how people perceive us."